Ligonier and Christian Audio are both offering free audio resources that you will not want to miss. First up, Christian Audio is offering ‘Martin Luther: In His Own Words‘ on their snappy new website. Hop over there today because the offer will expire after October 31. Second, Ligonier Ministries has 4 free mp3’s by R. C. Sproul you will want to get. Two messages are titled, “The Making of the Reformation”, and the second two are “Martin Luther” from the “Heroes of the Christian Faith” series. As an addendum, if you haven’t heard Mark Dever’s interview of Michael Reeves on the Reformation, I highly recommend you grab this one. Dennis Prutow, Professor of Homiletics and Pastoral Theology at Reformed Presbyterian Theological Seminary and author of the book So Pastor, What’s Your Point?, is interviewed on Christ the Center. 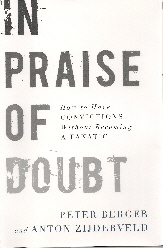 Al Mohler interviews Peter Berger, author of the book In Praise of Doubt: How to Have Convictions Without Becoming A Fanatic. Berger has had a tremendous impact on Mohler’s thinking, even though Mohler does draw very distinct lines of where he differs with Berger. One of the nice things about the format of Mohler’s Thinking in Public podcast, is that he helpfully prepares the audience by providing needed background and context before going into the interview. Then throughout the interview he turns off the tape, so to speak, to summarize for the listeners what was covered and explains how that information should be thought about as a Christian. Even though I was able to follow the discussion and the sociological concepts, Mohler’s comments throughout brought a greater deal of insight to this interview. Some of the important concepts drawn from Berger are his concepts of plausibility structures and cognitive contamination. On the surface these are word pairs that would cause me to check out of an article or interview. But Mohler has done such a good job keeping these things in a helpful context that I was intrigued. One of the reasons Berger’s work is so helpful is because the world in which we live today is a world of pluralism; a world where there are a great many ideas about religion and God coexisting. More than ever Christians today need to have a strong grasp of theology because we are bombarded by the contamination from this world of religious pluralism. And one of the dangers that we see repeating itself over and over is when well meaning Christians will bargain away parts of the Gospel that they would never otherwise surrender willingly. This is a very intriguing interview that will keep your mind churning long after it’s over. Hunter Baker, the author of the excellent book The End of Secularism has given three lectures at Southern Seminary on secularism and Christianity. If you have enjoyed this book, or have been interested in it, these lectures will be something you don’t want to miss.